An Ayurvedic massage increases the blood circulation, tones up the muscles and dilates the nerves thus effecting a new lease of freshness and vigor to your body. The herbal and naturalistic modes of treatments act on your bones and joints. These treatments cure you of many illnesses such as arthritis. Yoga and meditation are also can be arranged. You can also take up a training program. These programs usually last for about a month. Kerala’s equable climate, natural abundance of herbal and medicinal plants and the cool monsoon season (June-November) are best suited for Ayurveda's curative and restorative programs. Ancient texts recommend the monsoon period to be the best season for Ayurvedic treatments. The atmosphere remains dust-free and cool, opening the pores of the body to the maximum, making it most receptive to herbal oils and therapy. We also offer simple oil massages for relaxation, while full course treatments last for about 21 days. The full course treatments include a special restrictive diet and a daily massage. Twenty-one days are the minimum recommended period for achieving noticeable effect. Depending on the time you intend to spend in Kovalam, you can plan small tours to places nearby. Here are a few guidelines. An ideal package for spending two days. Peppara Wildlife Sanctuary spreads over 53 km and is accessible from Vidurai, which is on the way to Ponmudi. The sanctuary is host to a rich variety of flora and fauna. Nearby is situated the Peppara Dam. Covering the dam and the sanctuary will take you around half a day. Then move on to Ponmudi, 8 km from Peppara. Spend the rest of the day exploring the green winding lanes of the beautiful hill resort. Go for trekking the next day. Another package for a two day tour. The Padmanabhapuram Palace is 63 km from Thiruvananthapuram. Start the journey by early morning, say 6 a.m., you will reach the palace within three hours. Hang around the palace for another three hours. Have lunch then and by noon, continue the journey. You will reach Kanyakumari by 3 p.m. After a short nap in a hotel room, it's time to view the sunset. The visit to the Vivekananda rock can be made the next day morning. The short trip by boat is exhilarating. By afternoon, you can return and you'll be in Thiruvananthapuram by evening. If you have a week at your disposal, go for a tour package covering the three places Varklala, Neyyar Dam and Ponmudi. In Varkala, the sea and the Papanasom beach is calm and serene, compared to Kovalam, which at times turns murky due to an overflow of tourists. You can spend up to three days in and around Varkala climbing the high cliffs and bathing in the mineral springs. Neyyar Dam, 32 km to the south of Thiruvananthapuram, has a watchtower, crocodile farm, lion safari park and Deer Park. You can spend two days here roaming around the parks and enjoying the boat safari. Ponmudi, the beautiful hill resort, with its narrow, winding pathways and cool, green woods is an ideal place for trekking. Walking around the place immersed in lush greenery soothes you with a sense of cool. Two days will be enough to cover Ponmudi. If your stay in Kovalam is limited to one or two days, you can trip in and around Thiruvananthapuram. The capital city is known for its architectural magnificence. The many buildings built with red bricks and tiles also speak of the historical past of the city. A short skip around Thiruvananthapuram would take one day. Sree Padmanabha Swamy Temple, Napier Museum, Sree Chithra Art Gallery and the Priyadarshini Planetarium are places not to be missed. Do not forget to visit the Akkulam and Veli lakes. Thiruvallam and Vizhinjam are places nearer to Kovalam and are places ideal for one day tours. Thiruvallam is a serene backwater stretch enroute to Kovalam. You can enjoy canoe rides in this place. Vizhinjam is just one km away from Kovalam. There is a cave temple in Vizhinjam with rock cut sculptures of the 18th century. The outer walls of the cave temple depict half-complete carvings of Lord Siva and Goddess Parvati. Aruvikkara is just 16 km away from Kovalam, a picturesque spot situated on the banks of the Karamana River. You can roam over the beautiful dam site and feed the fish that fearlessly come close to the banks of the stream near the Durga Temple. Spend half a day there and move on to Nedumangad, where the Koyikkal palace is situated. You can see the nalukettu, the traditional Kerala style building which dates back to the 15th century. There is also a folklore museum and numismatics museum that preserves relics such as quaint musical instruments and household instruments of the past centuries, rare and historically valuable coins etc. You need only spend half a day here. Another one-week tour package. Get to Kumarakom first and spent two days there. Spend a day in the backwaters in the houseboats, and another one roaming around the Kumarakom bird sanctuary. Move on to Thekkady, where you can spend two days. The journey to Thekkady itself is an enjoyable experience. Once you reach there, make a boat ride to take an overview of the Periyar Wildlife Sanctuary. On the second day, you can go for trekking. The tribal villages offer a variety of sights and experiences. In Munnar, you can spend three days. Spend your first day in Munnar ambling through the sprawling tea gardens of the idyllic hill resort. Go to the Mattupetty Lake and dam on the second day and the Eravikulam National Park and the Chinnar Wildlife Sanctuary on the third day. If you are interested in trekking, Agastyakoodam is the place where you should go to. The place is accessible from Kotoor, near Neyyar Dam and also from Bonacaud. The advocated time for trekking in Agastyakoodam is from December to April after obtaining a pass from the Wildlife Warden, Forest Department, PTP Nagar, and Thiruvananthapuram. Agastyakoodam is a part of the Sahyadri range of mountains. The place is known for its teeming wildlife and for rare medicinal herbs and plants. House Boat / Rice boat Accommodation. 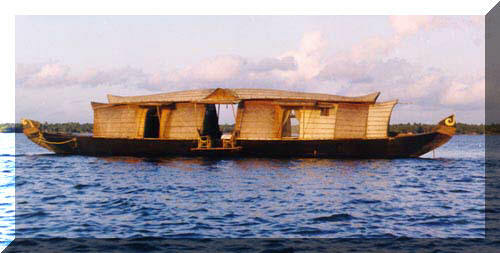 Traditional Rice Boat converted into Houseboats with all the basic facilities including night stay. The resort consists of 29 double bedrooms including 9 suits and is classified as 3 star resort.